Xtreme Pro has brought back what is known in the industry as "soft proofing" a term that means previewing how a photo or layout will print in CMYK or other colors. This feature was left out of Xara Xtreme but is back in Xtreme Pro. Xara operates in RGB (Red, Green, Blue) color space. The colors we see on the screen are comprised of red, green and blue pixels. Each pixel can have any one of 256 shades of red, 256 shades of green, and 256 shades of blue. If a pixel has equal values of RGB, 153, 153, 153, for example, the result is a neutral 50% gray. If a pixel has 0 RGB the pixel color is black. If the pixel has 255 for all 3 RGB values, the pixel is white. And there are 16.7 million colors in between (256 x 256 x 256). 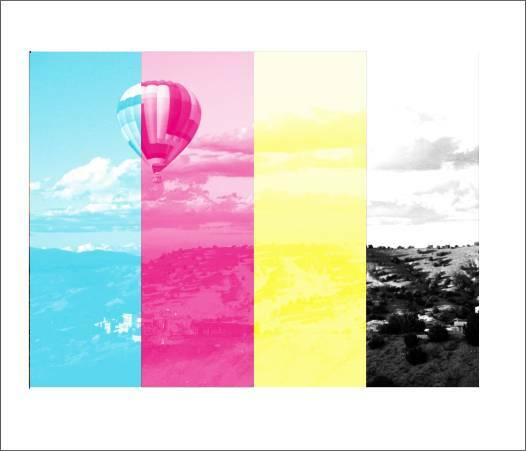 CMYK printing, also called four color process, uses tiny dots of 4 transparent inks, cyan, magenta, yellow and black to create its gamut of colors. These tiny dots of color printed next to and on top of other colors create the universe of millions of possible colors. Because the number of discernible CMYK colors is significantly less than the number of RGB colors, a CMYK color version of an image or solid color is often less vibrant or as saturated as the RGB image. This is especially true of blues and greens. 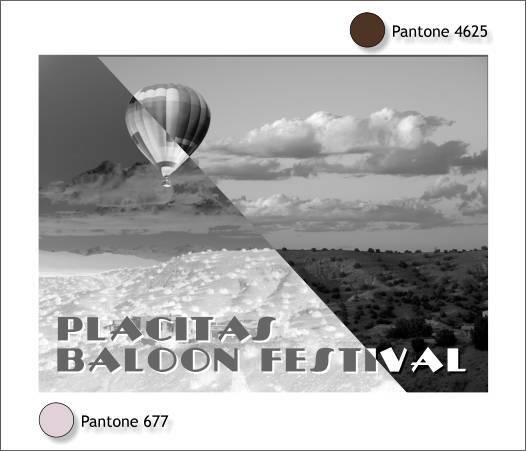 So my bright sunset photo of a balloon sailing over the Placitas hills (balloons do not fly at sunset, only in the early part of the day due to the air currents so obviously this photo is 2 photos combined) will not look as rich and vibrant when printed in CMYK. 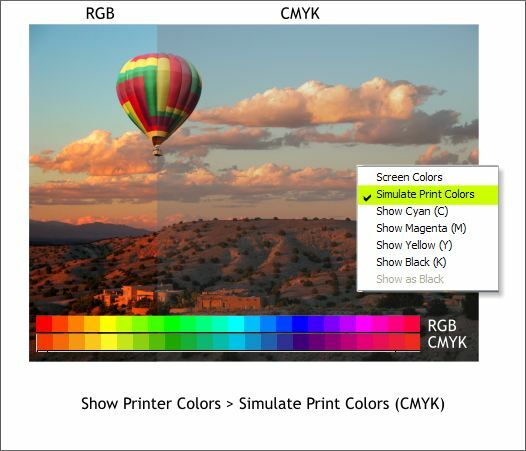 So, how can we predict how a photo we see on the screen is going to print in CMYK? If you said view the image in Simulate Print Colors mode, you get a gold star. 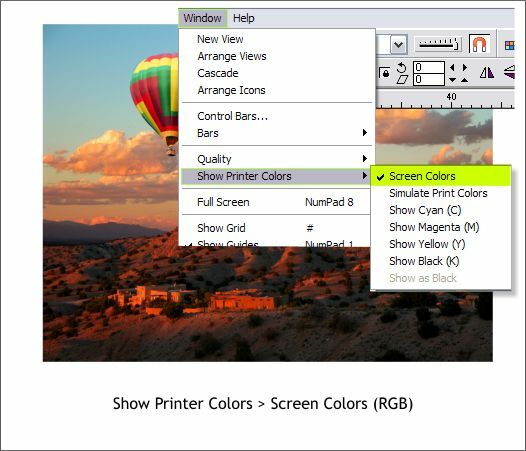 To see what a RGB image (or Pantone spot color) will more accurately look like when printed in CMYK, open the Window menu and select Show Printer Colors and from the fly out menu, select Simulate Print Colors . 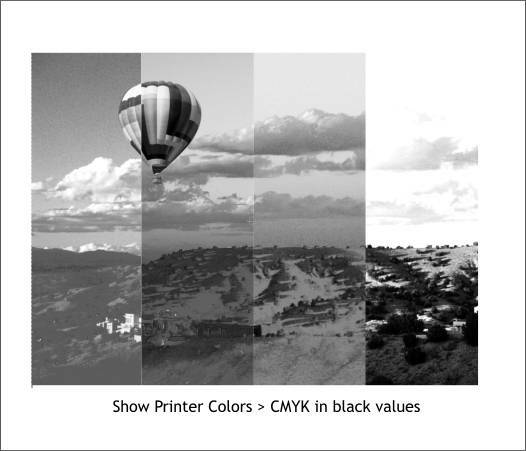 The image above shows the difference between RGB and CMYK. I have split the photo through the balloon to show the difference. Along the bottom of the photo you can see the difference between the named colors on the screen palette in RGB and then CMYK mode. The most affected area in the CMYK colors in between the yellow green and red magenta. It is almost impossible to reproduce any of this range of colors in CMYK. 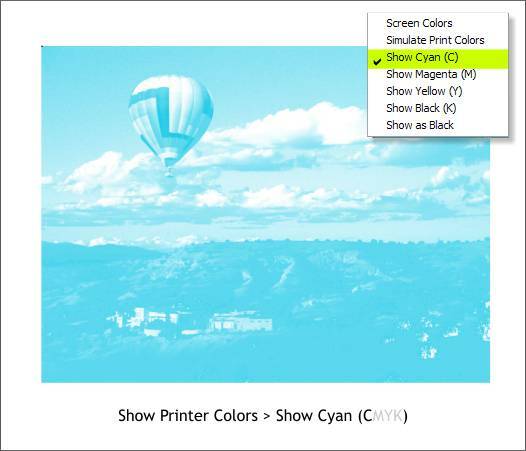 Users of Xara X1 will remember that in addition to Simulate Print Colors there were options to show the four process color components, Show Cyan, Show Magenta, Show Yellow, and Show Black . Well, these options are back in Xara Xtreme Pro. 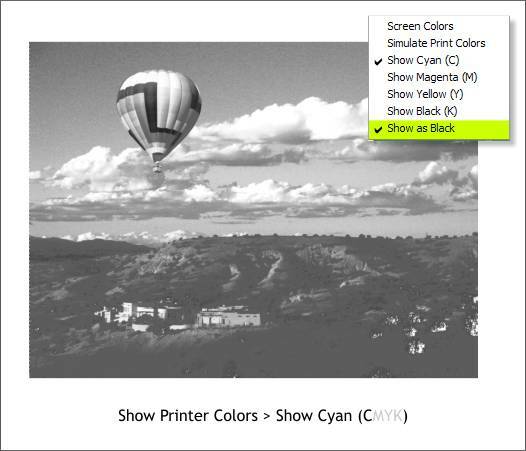 The option Show as Black is grayed out until you select one of the 4 show CMYK options. Shown above is the Show Cyan viewing option. This represents the amount of Cyan ink that is needed to create the CMYK image. The darker areas represent a heavier concentration of cyan while the white areas may contain no cyan at all. Printing plates are created from a grayscale version of each color. Shown above is the Show as Black option for Show Cyan and gives the designer and the printing professional or prepress person a good idea of how much cyan there will be in the final printed image. The white area has little or no cyan while the very dark areas have a greater amount of cyan. I've divided the photo into 4 strips showing the amount of each color. You can see there is virtually no black in the sky, but a lot of black in the foreground to add depth and detail to the colors in the dark areas. And here are the Show as Black grayscale values for each color. If you use Pantone spot colors (colors that are intended to be printed as solid colored and specially mixed printing press inks—and not made up of CMYK inks) , they also show up in the Show Printer Colors as you can see in the example above. What is new and improved is you can create a duotone image using 2 Pantone spot colors (this would be printed as a 2 color job), and the colors will remain spot colors and not be converted to RGB. In the past as soon as you mixed Pantone spot colors as in a blend or gradient fill for example, the resulting mixed colors became RGB which defeated the whole reason for using spot colors. And if you cheated and looked at the last page first, you will know that Xtreme Pro now supports Pantone spot colors in PDF documents. The image above was created by adding the 2 spot colors to the screen palette by applying a fill to a selected shape from the Pantone library in the Color Gallery (F9 ). When you apply a Pantone solid spot color to an object or text, the color is automatically placed on the screen palette in a circular swatch. 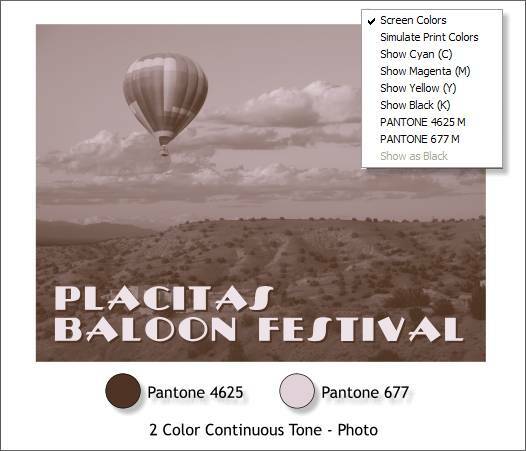 With the full color bitmap selected right click on the dark Pantone color to apply the dark values and left click on the lighter Pantone color for the lighter values. Here are the Show as Black versions for each color. This capability to "soft proof" (preview colors) is important to designers who get involved in commercial printing jobs. Printers create what are known as "progressives" in which they look at the individual colors (like the CMYK strips I showed earlier) to determine if a job that has too much of one or more colors. A good printer can make subtle adjustments to a job on the press to obtain a better balance of the color. They often work from sets of cyan and magenta only images, magenta and yellow images, yellow and cyan images, and variations of these using K or black. Often by looking at a set of progressives, the designer and printing professional can determine if one or more of the colors needs to be modified. Reducing the amount of cyan for example for a job that is printing with a bluish cast.